So my AC/DC Luci VE arrived today, but the excitement sort of wore off when I opened the cashbox to find it completely empty. Which means no pinballs, no power cord, and no bolts to hold the backbox in place. Also, should the ground wire inside the cabinet run through the area where I'm to install the shaker motor? (Red arrows are pointing to what I mean.) Is it normal to install a shaker motor over this wire? Need a tilt bob as well? I don't think the ground wire position is a problem as long as it is stapled to the cabinet. Do those two connectors mate? 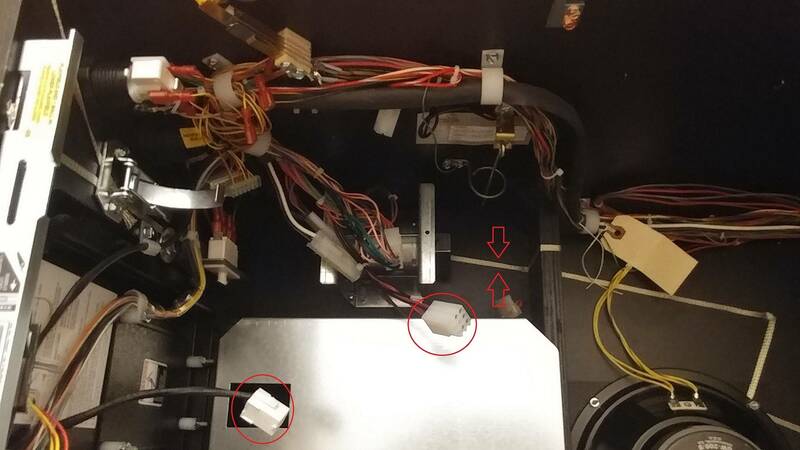 The connector circled in red by the bill validator, looks to be for a bill validator. I don't have one to check. The whiter connector circled in red. Is it for the fire button on the lockdown bar ? None of those are issues, except of course the missing balls, etc. Need a tilt bob as well? You scared me for a second. I think the tilt bob is just above the top arrow in that photo. Also, should there be a cover on the shaker? OK - great. More missing stuff. The shaker I order separately so, yes, it has a cover but I haven't installed it yet. Yeah. I think they just forgot to put the normal items in the coin box such as the goody bag, balls, and tilt bob. Is the owner's manual stapled to the inside of the cabinet? Oh and goodie bag, they should be staples together, right? Ya I’d the coin box is empty and that’s the only issue no biggie. Yes - I did get the owner's manual at least. Contact your distributor, who should be able to get you your missing parts. I like to go right to the source if possible. I would call Stern directly and if they won't take care of the issue I'd go through the distributor then. It might be quicker for you that way. No need for a bill validator, so that shouldn't affect me if that's what it's for, but I'm concerned if the other is for the fire button. Are other AC/DC owners also finding these two cables unplugged? I think that you need to look for a new distributor. If you would have bought from me, I would have had the parts in the mail the day you contacted me, and then i would have dealt with stern to replenish my stock, not have the customer wait. Yep. Its like 50/50 when you call. Always nice to have a good distributor to back you up. I texted my distributor a while back on a Sunday night with mmr issues. He had cgc tech support on the phone with me at 8pm on a Sunday! Awesome service!